If anyone doubted that we need a much more aggressive effort to create jobs — and if anyone doubted that our eight-month-long obsession with debt reduction was a giant distraction — today’s jobs numbers should clear away any misapprehensions. Employers added no net workers last month and the unemployment rate was unchanged, a sign that many employers were nervous the U.S. economy is at risk of slipping into another recession. The Labor Department says total payrolls were unchanged in August, the weakest report in almost a year. It’s the first time since February 1945 that the government has reported a net job change of zero. The unemployment rate stayed at 9.1 percent. Government employment continued to trend down over the month (-17,000). Despite the return of about 22,000 workers from a partial government shutdown in Minnesota, employment in state government changed little in August (+5,000). Employment in local government continued to decline. Since employment peaked in September 2008, local government has lost 550,000 jobs. I added the italics to make a point: The Obama administration’s original stimulus plan wasn’t big enough, but it did create and save millions of jobs, and one reason was the assistance it gave to state and local governments to prevent layoffs. That assistance is running out, and if there is one big “job-killer” out there, to use the Republicans’ favorite phase, it is all those government cutbacks in states and counties, cities and towns around the nation. We don’t know for certain how much debate there still is inside the administration about how big the president’s jobs proposal will be. But those who want to make it bigger are right, and these numbers should bolster their position. This isn’t just a matter of politics and the next election. For the sake of the country and the jobless, President Obama really needs to change the debate and make clear that it’s not just liberals who think the economy needs a boost right now. The ranks of those who believe in more stimulus include business people, investors and economists of many political stripes. Now more than ever, Obama needs to think and act big. 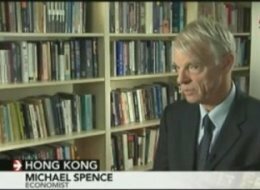 Michael Spence, professor at New York University’s Stern School of Business and winner of the 2001 Nobel Prize in economics, told Bloomberg Television Wednesday that there’s “probably a 50 percent” chance of the global economy slipping into recession. The possibility of the U.S. dipping back into recession has been of particular concern to economists. And Spence says any significant downturn at home would likely spread throughout the globe. A slew of recent economic data indicates the economy is slowing, if not soon to enter recession. This Spring, the U.S. economy grew at a rate of only 1 percent, according to the Commerce Department. GDP growth has been adversely affected by weak consumer spending — which accounts for 70 percent of the U.S. economy — and high levels of unemployment, economists say. Still, most economists in a recent survey said a second recession isn’t likely, putting the possibility of such a downturn within the next 12 months at 26 percent — half that of Spence’s estimation. Others seem to agree more with Spence, such as Meredith Whitney, who noted “increasing signs” of a double-dipearlier this month. So is history on Spence’s side: 9 of 11 recessions since World War II were preempted by periods of growth of 1 percent or less. What will it take to preempt a global downturn? “Bold action on both sides of the Atlantic,” Spence says. Jobs report is awful. Politicians’ response worse. Private-sector job growth, charted by Steve Benen. The June unemployment report is in, and it is bad, maybe even terrible. The unemployment rate edged upward from 9.1 percent to 9.2 percent. What’s worrying is that the economy seems to have stopped adding jobs. We already know we have millions of people out of work. Now we need businesses to hire some humans so the unemployment rate can go down. Overall, the economy added just 18,000 jobs. Statistically, it almost might as well not have added any — we need more to add 150,000 jobs or so each month just to keep even. The private sector kicked in 57,000 jobs, but government laid off 39,000 people. Notice that Mr. Romney left off the part about Mr. Obama making things worse. As bad the situation is — and it seriously is bad — it’s not worse than before the president took office. Where Did Those 10 Years of Job Growth Go? The Republican recession took a little over two years to eliminate almost an entire decade of job creation (2000- 2007) and now the GOP wants President Obama to create ten years worth of jobs in 3 years of his first term. The problem is this President was forced to comply with Republican demands of tax cuts and other supply side mechanisms in order to stimulate the economy. Let’s take quantitative easing for example. This was a federal reserve program that essentially flooded the big commercial banks with cheap money. Wall Street banks could approach the Fed and borrow cash at rates unseen in the regular market, approximately 1% or less. These funds that the huge commercial banks had borrowed are really your tax dollars that the Fed bought from the Treasury. The plan was to give money to big banks and it would filter down to your local, smaller banks and ultimately into the local economy. This unfortunately didn’t happen. What happened was, Wall Street sat on it. They bolstered their capital on hand, but rather than using their own profits to increase financial stability, they used your tax dollars. Interestingly, the Tea Party is still quiet about this. Over ONE TRILLION dollars of your money is stashed on Wall Street. Essentially, making job creation VERY difficult for small business due to tight credit. Many businesses take out loans just to pay employees. If the businesses can not access credit, they can’t hire, even if their demand for their products increases. Again, with out regulations, or rules to force corporations and banks to do the right thing, they won’t do it. That money Wall Street has from (QE) is completely separate from any stimulus the President wanted. The fact that every single Republican running for President blames President Obama for the longevity of their party’s recession is completely dishonest. The real job losses are greater than the estimate of 7.5 million. They are closer to 10.5 million, as 3 million people have stopped looking for work. Equally troublesome is the lower labor participation rate; some 5 million jobs have vanished from manufacturing, long America’s greatest strength. Just think: Total payrolls today amount to 131 million, but this figure is lower than it was at the beginning of the year 2000, even though our population has grown by nearly 30 million. It took almost an entire decade to increase jobs by 10 million (2000-2007), now the Republicans in power want President Obama to do it in 3 years? That is a little absurd, but at least private sector jobs are being created, just not at the rate we need to get out of this Wall Street-manufactured, GOP-induced recession. What President Obama and the government need to do is by-pass the banks entirely, create 50 state banks, just like North Dakota has. North Dakota missed the credit crisis. Capital is flowing to business and their unemployment rate is 3.5%. This Wall Street manufactured recession can only be cured with government intervention and NOT the free market.